This article first appeared in the premier issue of the revived At Cooper magazine. Subscription is free for all. 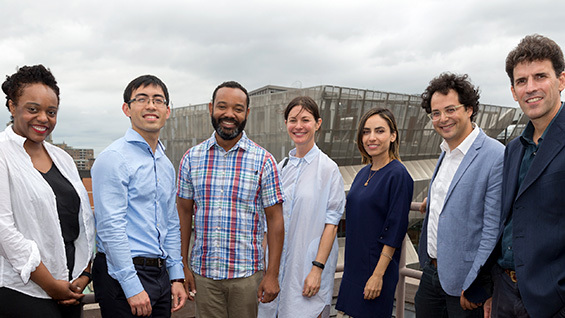 The Cooper Union will see an influx of seven new full-time tenure-track faculty members across a variety of disciplines in this academic year, with three more likely to be hired by year's end, reflecting a commitment to its current and future pedagogy not seen in many years. The result will be a 20 percent increase in the corps of full-time faculty. "We are restoring needed teaching capacity across Cooper's four academic divisions," says Bill Mea, acting president and vice president of finance and administration. "Even as we plan targeted budget cuts to reduce administrative costs, we are proud to sustain Cooper's investment in our extraordinary faculty. Doing so must remain a priority." This fall, the School of Art welcomes Leslie Hewitt A'00, Lucy Raven and William Villalongo A'99, all practicing artists with teaching experience. Neal (Simon) Kwong CE'09 and Neveen Shlayan are joining the civil and electrical engineering faculties respectively at the Albert Nerken School of Engineering. The Faculty of Humanities and Social Sciences (HSS) welcomes Diego Malquori, a philosopher (and astronomer), as well as Raffaele Bedarida, an art historian. The Irwin S. Chanin School of Architecture anticipates hiring new fulltime tenure-track faculty by the spring semester, and HSS looks to add an economist as its third new hire. In some cases the incoming faculty members bring fresh perspectives to fields already taught. Civil engineering has not filled a new tenure-track position in 30 years, according to Professor Jameel Ahmad, chair of the department. In other cases the new faculty members represent whole new fields. In HSS the addition of a philosophy teacher will be a first. At the school of architecture the impact of the future faculty will be "enormous," says Nader Tehrani, the dean of the school, in a longer interview. "We currently have three full-time faculty. In another era, we had up to eight. Expanding our fulltime faculty will enable us to share broader administrative and intellectual responsibilities." In an extensive interview, Mike Essl A'96, acting dean of the School of Art, says, "The new faculty hires were an opportunity to consider how we can shape the future of the school. What's amazing about the artists we hired is that all three of them could teach across disciplines, which really fits with the generalist model we have at the School of Art, where there are no majors." Leslie Hewitt, for example, creates works that "invite viewers to experience a unique space between photography and sculpture, interrogating notions of perception and perspective," she says. Her interdisciplinary individual art practice includes works consisting of large-scale photographs that rest inside substantial wood frames that she leans against the wall. She also collaborates with others, most recently with renowned cinematographer Bradford Young. Their project Untitled (Structures) from 2012, a two-channel video installation of a series of silent (nonlinear) vignettes filmed across American historical and imagined landscapes, was installed in various national and international art centers. Having taught as a visiting artist in the School of Art, she says of her teaching: "My goals are to continue to strengthen and improve the courses I teach, to collaborate with my colleagues in order to ensure excellence in the School of Art and to work to sustain a meaningful link between Cooper Union and the visual arts as a point of engagement with and in the world." Lucy Raven is similarly multidisciplined in her artistic approach. She works with animation, installation, sculpture and sound. "I'm currently developing a photographic animation about a sound-making mobile made by Alexander Calder," she says. "The mobile was a collaboration with New York School composer Earle Brown and is meant to be played by a percussion quartet. I was able to document a rare, recent live performance of the piece. I'm working with the recorded audio to structure my edit so that the sound determines the rhythm at which my photographs of the mobile are animated." Unsurprisingly, her teaching will be multivariant as well, she says. "I'm eager to think about new ways to approach the connections among film, video, animation and sound, as well as possible relationships between distinct departments, such as how sculpture and film, or drawing and video, might connect." William Villalongo describes his narrative figurative paintings and drawings as "set in a utopian landscape in which nature and people negotiate their form. I employ satire, mythology and fiction to rethink dominant narratives of history. I am concerned with expanding limited representations of the black figurative image in painting." The Painting Lesson, a large work on a wood panel, depicts a group of women painting a central figure who evokes Josephine Baker and her famous banana skirt. But the artists are creating abstract works. Of his goals as teacher he says, "I believe that in an educational environment, goals develop out of dynamic engagement with students, faculty and staff. My personal goal is to share my experience, knowledge and personality within this dynamic and help produce conversations that bring it strength and complexity." Among the engineering faculty, Neal (Simon) Kwong will be the first graduate of the civil engineering program to return as a fulltime faculty member. "Simon brings a much-needed fresh perspective and energy to the department," says Jameel Ahmad, professor and chair of the CE department. "Because of his strong background in structural engineering and earthquake engineering, Simon will contribute to the CE faculty expertise in structural dynamics, resilient infrastructure, applications of probability and statistics, and finite element analyses." Professor Kwong has lately been working to quantify the seismic risk of buildings with less complexity and computational effort. Of his time here, he most looks forward to "the opportunity to give back to the students and the institution, just as they did to me when I studied here as an undergraduate," he says. Neveen Shlayan joins the electrical engineering faculty as an expert in cyber physical systems, a computational field that weaves together hardware, software and networking. Self-driving vehicles may be the best-known application of such systems. Professor Shlayan has been conducting research in a related discipline. "My current project involves the development and deployment of cost-effective Bluetooth and Wi-Fi sensor networks for anonymous pedestrian detection," she says. "The main objective of this study is to explore the various ways transit rider data can be used and to develop data-driven pedestrian modeling and parameter estimation techniques in order to enhance the performance of public transportation systems." Her plans for teaching seem to mirror her research in smart movement. "Observing students and faculty is an essential step for me in my attempt to become an effective teacher," she says. "I find that teaching is an ongoing journey of learning." The third group of new faculty will be joining HSS, an addition William Germano, the dean, is "thrilled" about. "Raffaele Bedarida has taught with us for a couple of years but will now be full-time," he says. "Professor Bedarida is a popular teacher, and with good reason: his enthusiasm and knowledge of 20th-century art carry over beyond the classroom. Bringing him on gives the college the continuous presence of a scholar-teacher committed to the study of modern art, which is critical for our students." Professor Bedarida particularly focuses on art and politics. "I am especially interested in the exchange of contemporary art exhibitions between countries as a form of cultural diplomacy," he says. "I like this approach because it is discursive and transnational. It also helps historicize and revise dominant art-historical narratives. I have enjoyed the intensity of class discussions with art students on the relevance of key art-historical questions from a contemporary perspective. As a full-time faculty member I would like to extend that conversation outside the classroom and beyond art students." Diego Malquori arrives as the very first assistant professor with a philosophy degree at HSS, a field he arrived at after getting his first doctorate in astronomy, studying the evolution of galaxies and of the whole universe. "Yet, even at that time of completing my Ph.D., I clearly felt that what is important is not the object of our gaze, but the very attitude of humanity facing that infinite," he says. "Thereafter, thanks to a work on the concept of time—where I explored the difference between ‘physical' and ‘intuitive' time—I started thinking about the expression of temporality, focusing in particular on contemporary art." He is impressed with The Cooper Union's "strong willingness to create a multidisciplinary environment," he says. "I hope to offer my scientific and humanistic knowledge to cross boundaries and to encourage students' critical thinking. I believe that such a multidisciplinary approach is crucial to discussing many important questions, such as the role of science in our society, the relationship between science and life or the meaning of art in our time."